Seadrill's stock could soar if these three industry dynamics play in its favor. One of the great advances in oil and gas drilling over the past decade has been the expansion of ultra-deepwater (over 5,000 feet of water) drilling. The industry's ability to move into deeper and deeper water has led to the discovery of new reserves and increased oil production at a time when conventional wells are drying up. One of the leaders in this industry is Seadrill (NYSE:SDRL), which has one of the largest and youngest deepwater fleets in the industry. There are three major reasons the company can improve earnings and be profitable for investors over the long term. Onshore oil has long been the primary source of oil worldwide, but that has changed dramatically in the last two decades. As you can see below, more than three-quarters of oil discoveries last year were offshore, and more than half were in ultra-deepwater. This plays right into Seadrill's wheelhouse, with 34 drillships and semi-submersibles and another 11 under construction. The company is one of the most leveraged in the world to the ultra-deepwater drilling market, and if it's where most of the new oil is being found, that should lead to higher demand for rigs. The macro energy picture can't be ignored when looking at Seadrill. Finding new reserves in ultra-deepwater is great, but it's expensive oil to drill for, so if cheaper alternatives account for enough to replace what's consumed each year, it wouldn't help Seadrill. That's why growing demand for oil overall is important. You can see below that outside of a slight blip during the 2008-09 recession, demand for oil has been growing steadily for nearly three decades. 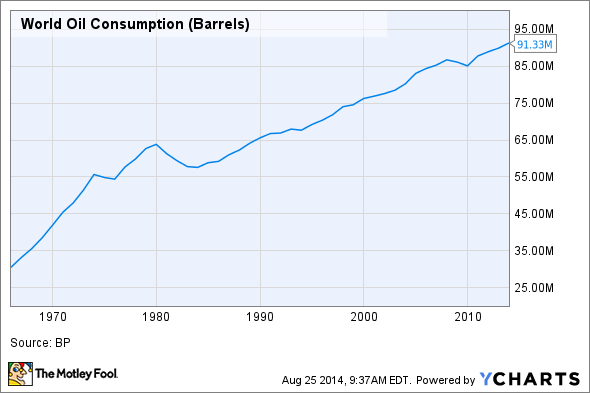 World Oil Consumption data by YCharts. The growth you see above is despite a decline in consumption in both the U.S. and Europe. But as the middle class in China and India grows, demand should continue to rise slowly. This growth will be key for demand of Seadrill's rigs long term. While conventional oil is becoming harder to find worldwide, shale drilling in the U.S. is booming. It's shale drilling that is pushing the U.S. toward energy independence more than growing drilling and reserves in the Gulf of Mexico. But not everyone is excited about the potential of shale. France, the Czech Republic, Germany, Bulgaria, and others in the European Union have either banned fracking or only recently allowed limited drilling permits. Even cities and counties in the U.S. are starting to do the same given concerns over water safety, which has been hotly debated in the U.S. The countries getting into shale drilling like China, Poland, and Ukraine are primarily countries rich in natural gas. All of this is in Seadrill's favor because more and more oil and natural gas is going to have to come from the depths of the oceans to meet the world's needs. If the shale boom that increased the U.S.'s reserves over the past decade doesn't go global, it will push demand offshore. Big oil companies will see little choice but to increase drilling offshore in ultra-deepwater wells that have proved reserves around the world. Long term, that's what Seadrill investors need to see. In a lot of ways, Seadrill is at the mercy of the global energy market, and it's those macro trends investors are really betting on. But with ultra-deepwater offshore reserves growing, global oil demand increasing, and Seadrill equipped with one of the youngest ultra-deepwater fleet in the industry, there's still significant upside for Seadrill.